Ethiopian Christmas and the Ethiopian Calendar System | Folklife Today | Ye Dallas Radio! - የዳላስ ራዲዮ! This is a guest blog post by Fentahun Tiruneh, Area Specialist for Ethiopia and Eritrea in the African and Middle Eastern Division at the Library of Congress. On January 7, 2016, Ethiopian Christians, particularly the followers of the Ethiopian Orthodox Christian Church in Ethiopia, the USA, and elsewhere, celebrate Christmas. In Ethiopia, it is usual for the youth to draw colorful flowers on paper sheets or cut some wild flowers and hand them to relatives and neighbors and receive money or gifts or promises in exchange. Midnight mass takes place on Christmas eve, and includes elaborate chants and beating of drums. Men and women dress in their best clothes, and young people receive new clothes by their parents and or relatives. Books, recently translated into Amharic from ancient manuscripts written in Ge’ez, reveal a new interpretation of the story of the Magi, the three wise men who visited the scene of the nativity. Ge’ez is an ancient Semitic language which is mainly used today in the liturgy of the Orthodox Churches in Ethiopia and Eritrea, the Ethiopian Catholic Church, and the Beta Israel Jewish community in Ethiopia. Based on these new revelations, Ethiopian historians are now looking at the theory that it was Ethiopian kings who traveled from different parts of ancient Ethiopia to present the gifts to the Christ child to fulfill the prophecy of their sages. Maṣḥaf Kebur (መጽሐፍ ክቡር), an Amharic source published in 2008/9, lists the names of the three wise men and the kings who accompanied them to Jerusalem. The first wise man was Agoja-Jabon; with him were three kings, namely Abol, Tona and Baraka. The second was Magal who had with him Kings Makdas, Awra, and Murno. The third wise man was Agabon who was accompanied by Kings Hajabon, Abulsalam and Arstatalu. The King of Kings of all the sovereigns was Atse Bazen, son of Nalk. According to the narrative translated from the Ge’ez manuscripts, it took two years for the sovereigns to arrive safely in Jerusalem. To this day in each Ethiopian household in Ethiopia, the USA, and elsewhere, coffee is served three times using the same beans in memory of the three kings: Abol, Tona and Baraka, each serving named after one of the three kings. Legend has it that these three kings consumed coffee on their way to Jerusalem in order to stay awake. Besides leaving the legacy of coffee drinking, it is believed that the three kings knew how to tell the time and the year by observing the stars and the moon. The Ethiopian Christmas always falls on January 7, based on the Ethiopian Christian Orthodox Calendar system. Although there are several calendar systems in Ethiopia, the solar-based calendar system has been adopted as the national calendar. According to the Ethiopian Orthodox calendar system, the world was created in 5500 B.C.E. — see Manuscript #23, a calendar book in the Thomas Kane Manuscript Collection at the African and Middle East Division — and Adam was born 5500 years before the birth of Jesus who, according to the teachings of the Ethiopian Orthodox Church, was born on January 7. The Ethiopian year consists of 365 days, divided into twelve months of thirty days each plus one additional month of five days (six in leap years). Ethiopian New Year’s Day falls on September 11 and ends the following September 10. 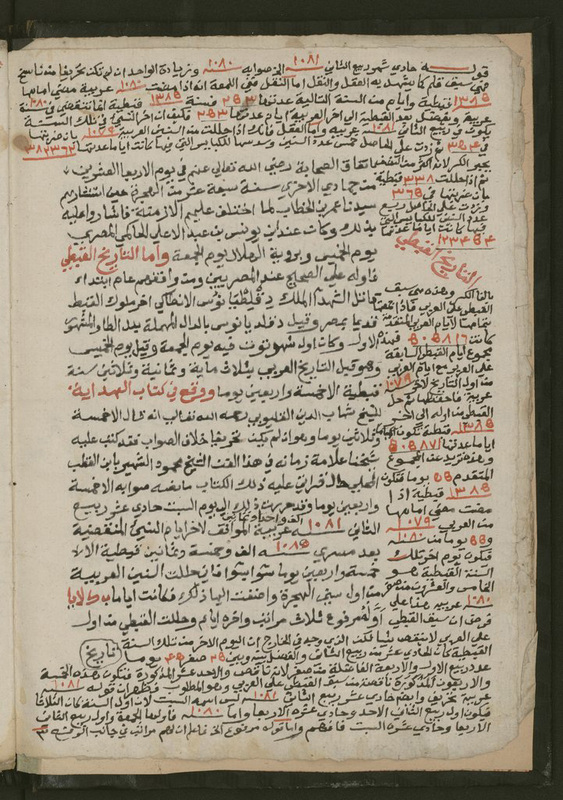 Bahera Hasab, (Computus). Manuscript #23 in the Thomas Kane collection. African and Middle Eastern Division, Library of Congress. 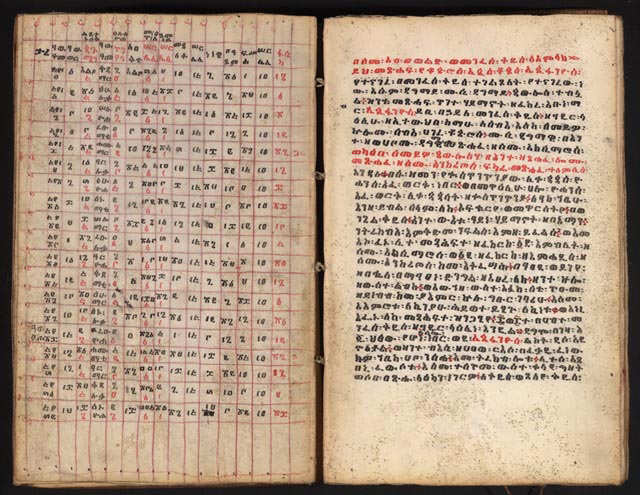 This Ethiopian manuscript, in the languages of Amharic and Geez, is open to a page explaining the mathematical system for fixing the movable feasts and fasts of the Ethiopian Orthodox Church. Select the image for a larger version. A Treatise on Zodiacal Signs and Constellations: Unique Jewels on the Benefits of Keeping Time (Risalah fi al-buruj wa-al-manazil: Faraʼid jawhariyah fi fawaʼid al-miqatiyah). By Muhammad ibn Muhammad Budayri. 1831. In Arabic. African and Middle Eastern Division, Library of Congress. View the catalog record. Page 3 describes the origin and history of the Coptic calendar and its conversion to other calendars. Select the image for a larger version. Egyptian Coptic Christians also celebrate Christmas on January 7. Some Ethiopian scholars believe the Ethiopian calendar system was copied from the Coptic Orthodox Church of Alexandria. The Ethiopian Orthodox Church claims that though the calendar systems appear similar with that of the Alexandrian church, the Ethiopian calendar was not an import but evolved to its present status with input from sister Eastern Christian churches. The Library’s African and Middle Eastern Division houses a very important collection of books, manuscripts, newspapers and journals on Ethiopia and Eritrea, that are invaluable resources on the Ethiopian Orthodox Christianity and its calendar system. Among these resources is the Thomas Kane Collection, acquired in 2002, which includes manuscripts and rare books in Amharic, Ge’ez, and other Ethiopian languages.